"Three Westbrook Junior College Students, Class of 1935"
Three Class of 1935 Westbrook Junior College students sit together on the campus grass in this black & white photograph. 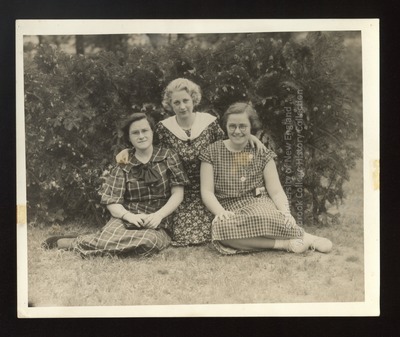 Alberta Hobson, Katherine Clark and Hazel Lundy sit in front of an evergreen in a triangle pose. Two of the girls wear glasses and sit on their legs with their feet extended to the left and right. The center girl kneels and has a hand on each of her friend's shoulders. The three wear spring/summer plaid and floral dresses and look directly at the camera. Their hair is parted and softly curled or waved over their ears.